Aloha and welcome to our little paradise at the Luana Kai. Our unit is unique, luxurious oceanfront condo with an ocean and pool view. We have an open kitchen with maple cabinets and granite counters. It is tiled from the bedroom through the lanai. The bathrooms have new cabinets and granite counters. There is a wooden floor in the master bedroom and in the stairs. You will have a nice view from the lanai to the ocean with unforgettable sunset. Big lanai where you can have your meals with a nice ambiance and a gorgeous view. Enjoy our bright and breezy condo with all amenities you will need for a wonderful vacations. We have this property for so many years and we have many repeated customers. I am an accountant and my husband is a radiologist. Both are Canadians and Americans. We have 2 adults children. We travel to Maui at least 3 times per year and Europe one or twice per year. We love traveling and we are windsurfer, tennis player, skier, etc. 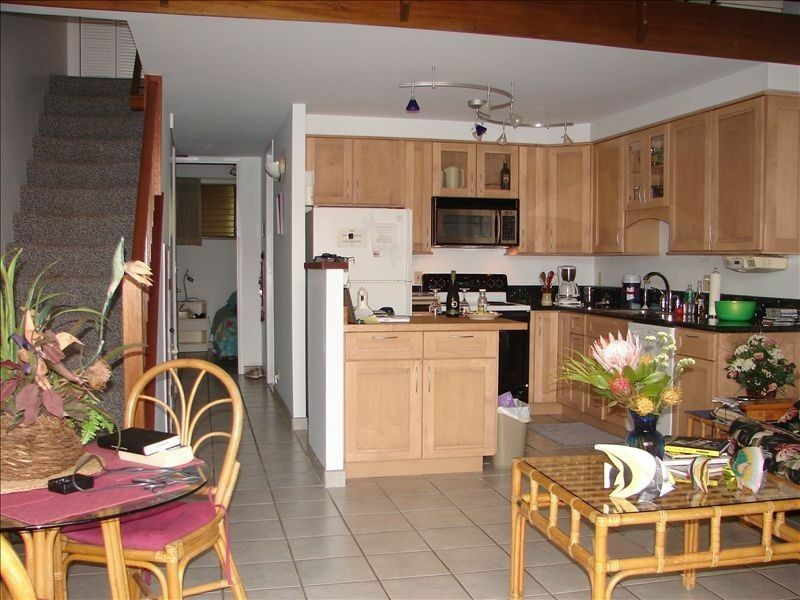 This condo has a gorgeous view on the ocean and we have the sunset in front of our beach in winter time and you can see the whales from the lanai. We take great care of your condo and keep it updates. We loved the condo. Good location central to multiple spots on the island, and had fun with the BBQ at the pool. Thank you very much for the nice reviews and hoping to have you again . Clean comfortable with a fantasic view. Conveniently central location for all our activities. Recommend adding additional lighting in the area of the table. We really enjoyed our time, Mahalo to Carroll for providing a great vacation property. I will look to change the pillows but it is always difficult to choose pillows people would like because some like them hard, other puffy, etc. For the lights in the table area it is very difficult to do something because of the cathedral ceiling and because we always eat outside I was not aware of the problem we will try to think for something to have more lights around this area. Thanks for the review and we will look to ameliorate our places. We very much enjoyed our stay and hope to get to stay there again! It was amazing! The property was great! The condo was comfortable the bed in the loft was one of the most comfortable beds I have slept on. The view was great the pool was great and it was so nice to have a washer and dryer. The owner was very accommodating! Great condo, peaceful and well kept grounds, wonderful trip! Wonderful trip! I’d definitely stay here again. Such beautiful accommodations. Everything was clean, kitchen was well stocked. It is the perfect Kihea location, literally just steps from the beach. Beautiful ocean view from the lanai. it doesn't get any better! My family and I just returned from 9 days at the Luana Kai resort. The unit was very clean and well stocked. The view from the lanai is stunning and we could watch the whales migrate up the coast. The pool and barbeque area is very clean and well maintained as was the rest of the property. The unit does not have air conditioning but has two well placed ceiling fans that provide plenty of air circulation. The layout of the unit was perfect for our family and the property is very family friendly. We would recommend this unit to other travellers looking for all the comforts of home. We will be back. Aloha. Thank you very much for your nice review. I am very happy you had a good time.